Sewer overflow spills solid and liquid waste from sewer system onto surface. Utility operators can now choose environmentally-friendly Helix Labs Bio Fresh™ to conduct a quick, odor-free cleanup after an event like this. Mechanically cleaning, vacuuming or hosing a sewer overflow or wastewater spill will remove a lot of solid waste, but a layer or film of waste will remain to bother residents unless a chemical cleaner is applied. However, harsh chemical detergents can damage nearby vegetation and animal life. It is better to use an environmentally friendly cleaner to finish the job. Helix Labs BioFresh™ is a premium biologically active product that works to deodorize, clean and restore areas affected by wastewater spills. BioFresh™ is non-toxic, non-corrosive and non-hazardous. The BioFresh™ bacteria naturally deodorize and digest sewage, grease, food and other waste found in sewage and wastewater spills, toilets, urinals, garbage dumpsters and other odor sites. It has effective odor control agents and microorganisms that immediately knock down the most awful, noxious spills. BioFresh™ is a very concentrated product and can be diluted with water to a 64:1 ratio. Operators and Cleaning Crews can apply BioFresh™ to a spill site with anything from a heavy sprayer to a mop bucket. Helix Laboratories BioFresh is a biologically active cleaner available in 6 and 55 gallon pails. If you are new to Helix Labs, bio-augmentation and biological odor control products, BioFresh™ will be an easy introduction for you and your team. BioFresh™ has been proven as an excellent clean-up product at dozens of cities in the United States. Martech stocks Helix Labs BioFresh™ in 6 and 55 gallon containers. Start your BioFresh™ order by clicking sending your request to Martech. Grease. Grease. if it’s not treated as solid waste, it’s dumped into your water treatment system when home owners and commercial businesses rinse grease down their drains with hot water! Liquid grease solidifies at 13°C (55°F), floats on water and adheres to sewer lines. Grease buildup in sewer pipelines reduces the capacity of the line and restricts the flow of wastewater (increasing the risk of overflow). Grease layers that break off can create total plugs downstream (guaranteeing a sanitary overflow event!). Estimates by US Environmental Protection Agency state that 25-30% of all sewer blockages are caused by Fats, Oil and Grease (FOG) build-up. 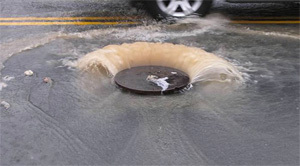 75% of sewer systems are working at half capacity due to grease build-up and clogs. Sewer operation and maintenance costs (and fees) go up. Helix Laboratories makes biological products that “eat this problem for breakfast”. Helix Labs is a science-based company with an environmentally friendly philosophy. They create and manufacture bacteria & biological products that improve wastewater systems via Bio-Augmentation. Helix products are available in three delivery formats: Liquid form (best), Powders and Blocks. Municpal utilities and food businesses are encouraged to use the Helix bacteria to reduce and maintain lower levels of FOG and prevent new FOG build up in the sewer system. ARE YOU WORKING WITH MUNICIPAL WASTEWATER SYSTEMS? Contact us to obtain an “Introduction to Helix Labs bacteria” presentation.